An ancient circular staircase leads down into the catacombs. In the late second century, when Kom el Shaqafa was an active burial site, bodies were lowered by rope down the well formed by the spiraling stairs. The staircase ends at a landing vestibule, where two benches are carved into wall niches overarched by the cockleshell motif often found in classical designs. A rotunda pierced by a six-pillared central shaft opens off the vestibule. To the left lies the triclinium, the funeral banquet hall where friends and family gathered on stone couches covered with cushions. Here they reclined while ceremonially feasting in memory of the deceased. Scholars believe that the catacombs at first may have served one family, but they were expanded into a mass burial site, probably administered by a corporation with dues-paying members. This theory could explain why so many chambers were hewn from the rock. A staircase from the rotunda descends to the second level, an area eerily alive with sculpture. In the vestibule, two pillars are topped by the papyrus, lotus, and acanthus leaves of ancient Egypt, their frieze adorned by two falcons flanking a winged sun. 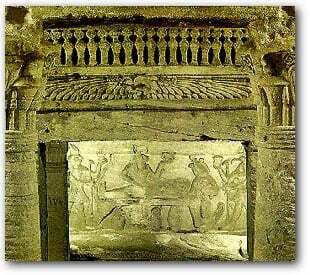 Carved into wall niches are figures of a man, and a woman, perhaps the tomb's original occupants. The man's body assumes the stiff hieratic pose found in ancient Egyptian sculpture, but his head is in the lifelike manner of the classic Hellenes; the woman's stance is also rigid, but she sports a Roman hairstyle. Three gigantic sarcophagi with lids that do not lift rest along the sides of the chamber. Scholars assume that bodies would have been inserted into them from behind, using a passageway that runs around the outside of the funeral chamber. Further circling this central tomb chamber is a hallway with 91 wall niches, each one providing burial space for three mummies. Returning to the first level, visitors can reach a separate set of tombs through a breach in the rotunda wall, unintended by the original builders. It leads to what has been called the Hall of Caracalla, where bones of horses and humans were found. The hall's name comes from an episode in A.D. 215, when Emperor Caracalla ordered Alexandrian youths to review, then massacred them.